Recently purchase a new piece of equipment? Trying a new substrate or glue formula? If so, chances are your team is gearing up for a glue trial. Here is what to expect during a standard animal glue trial with the LD Davis technical team. Before your glue trial, there are a few things you will want to have set up at your facility. First, it's always best to start with a clean glue pot with fresh glue. This will ensure that the glue formula runs smoothly and without contamination from any old glue. If you need some tips on cleaning your glue pot, check this out. 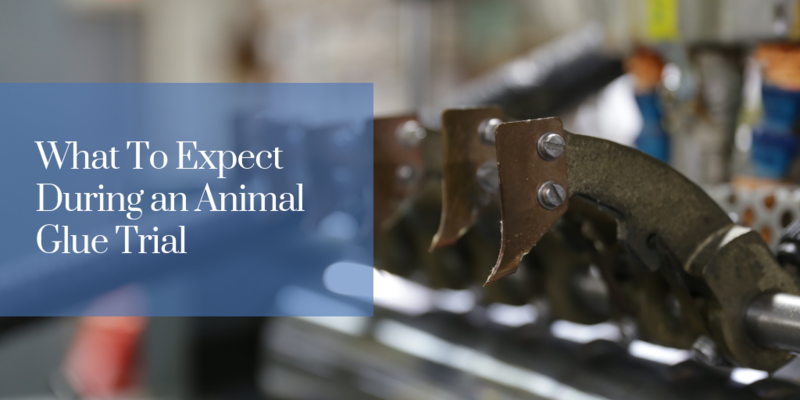 Next, your animal glue and substrates should be staged in a climate controlled area near the equipment about 24 hours before the trial. This will ensure you are not adding cold glue cakes into the pre-melter, and that there is no risk of substrate warping. When the LD Davis technical representative arrives on-site, they will hit the ground running by performing tests on the melted glue to make sure it's set up to run at the recommended settings. While performing these tests, they will train your team members so they are able to perform the same tests on their own in the future (we're always happy to help whenver needed). + Glue Film Thickness (completed with a mil depth gauge) - checking to see how much glue is being applied to the substrates at the roller. After the glue is set up at the optimal running parameters, you can start running the glue. Our technical representative will stay with your team as you begin to run the glue on your substrates. They will assist in adjusting the equipment speeds as needed depending on the substrate size. Keep in mind, not all pieces of equipment are identical to one another. There may be scenarios when the optimal temperature and viscosity on one machine is slightly different from another - this is perfectly normal, and the LD Davis technical representative will help you notate what settings work best on which machine. Depending on how many pieces of equipment you are using, a glue trial can be anywhere from a couple of hours to a couple of days long. Be prepared to learn a lot! After the glue trial is complete, your team should be equipped with all of the information needed to run their animal glue properly. Of course, there may be times you hit a snag with a new job, or a new substrates. Always feel free to contact our team to assist with any glue issues you may have!